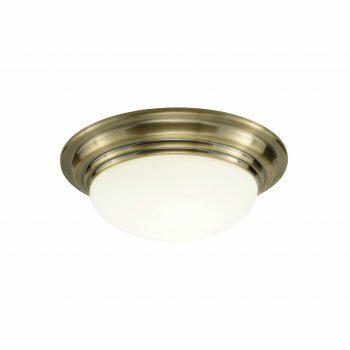 Dar Lighting Barclay single light large flush ceiling fitting features a circular design ceiling plate with antique brass edge detail and a dome shaped opal glass diffuser. The product code for this Dar ceiling fitting is BAR5075. This stylish bathroom fitting has both a traditional and modern look, making it a perfect choice for any bathroom decor within your home. IP44 rated makes it suitable for bathroom use. The Barclay range includes a smaller size flush fitting and is available in both antique brass and polished chrome finish.